Certified Divers - If you are a certified diver or you are interested in becoming a certified diver contact Jim Grier for information. 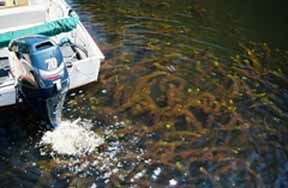 Milfoil Tenders - Deliver full bags of milfoil as certified divers fill them to tending pontoon boat for delivery to offshore dumping area. Kayak, canoe or row boat needed. One can be supplied if you do not have access to one. Milfoil Weed Watchers - Periodically patrol the lake and drop markers if exotic milfoil is found. Get markers from Jim Grier. Contoocook Lake Water Testing - Contoocook Lake water is tested three times a season to ensure impurities such as phosphorus and nitrates are not too high.